You have one opportunity to make the first impression. In most cases, clients place the vehicle to be stored in our sister facility for the duration of the sale. This purpose built heated facility set in 200 acres on the fringe of the Ashdown forest not only proves an ideal environment to store precious cars, with sometimes up to 20 cars available, a nice place to visit whether to view a specific car or just to meet us to find out more. Whilst in store, the cars are held to the owner's orders and are prepared for market to a standard agreed in advance and at the time of our appointment. 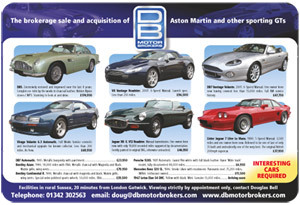 DB Motor Brokers will then take your car to market having researched the vehicles history, photographed the vehicle in detail and agreed our initial web presentation and subsequent advertising campaign. Through selective marketing, special presentation and using our network of existing contacts, the best buyer or particular car is secured.